Beth Greville-Giddings is a teaching assistant and the research lead at Westbury Academy (7-16 SEMH) in Nottingham. She is currently working with Raleigh Learning Trust to develop their CPD offer following completion of the Teacher Development Trust Associate in CPD Leadership course. We all know from working with students that learning can be complex and if we are to facilitate and evaluate professional learning, trying to understand how this process works for teachers and other staff in schools seems like a good idea. During the TDT Associate in CPD Leadership course, I identified ‘culture’ as a priority for change in my setting and I’ve focused a lot of my work on how to meet the needs of individual members of staff – both in terms of content and process. Guskey’s (2002) level model of professional learning (figure 1) specifically demonstrates teacher learning and shows a linear, causal relationship between each of four levels. This assumes each level is increasingly informative and success at one level is necessary for success at subsequent levels. It also suggests that if one level fails it is because of the previous level. 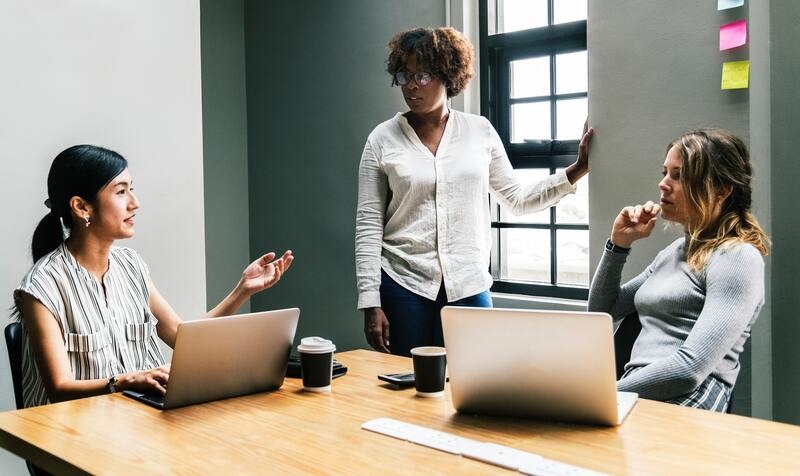 There is no account taken of external factors such as employee trust or something like impending retirement that may get in the way of change, and I struggled to connect this with the research I had looked at on individual need. Of course, student outcomes (academic or otherwise) should be a main driver of CPD, but I’m developing a whole-school programme where not all members of staff work with pupils in the same way, so does everyone need to see change in pupil outcomes before they change their attitude and beliefs? Weston and Clay’s (2018) Depth of Practice Framework shows how important it is to recognise different starting points and the need to offer professional learning opportunities that take into account staff with differing levels of experience and expertise. Where a topic is being introduced for the first time it is appropriate to facilitate awareness of ideas without the expectation that they are put into action. As expertise increases, engagement should move from following procedural systems to deliberative practice and opportunities for self-generated realisations in what Kennedy (2016) terms ‘a-ha’ moments; as staff gain higher levels of expertise they will become able to adapt to situations more automatically. Different topics will have different starting points and processes of engagement for different people and for me this highlights professional learning as an individualistic process. In a recent paper, Boylan et al. (2018) analyse and critique five models of teacher professional learning; identifying possible limitations and supporting an informed selection of models by researchers and practitioners. The first three models are variations on path models, by Guskey, Desimone, and Clarke and Hollingsworth, with a systemic conceptualisation proposed by Opfer and Pedder and a model that theorises the cognitive processes of professional learning by Evans. Whilst there are features of all the models that are relevant to my work, I found a particular connection with Clarke and Hollingsworth’s (2002) proposal of an Interconnected Model of Professional Growth (figure 2). Building on the work of Guskey, they propose a non-linear model that shows change occurs through processes of reflection and enactment in four domains: external, personal, practice and consequence. Not only does this take external influences into account but integrates them within the model. It also facilitates a responsive approach to individual needs as they state that ‘professional development programs should be deliberately designed to offer participants the opportunity to enact change in a variety of forms and change sequences consistent with individual inclinations’. This is particularly relevant as they pose that individual teachers will ‘value and consequently attend to different things [within a professional learning experience]’ and ‘the nature of the inferences drawn depends entirely upon the value system of the teacher’ – something David Weston discusses in his post on Argyris’s ‘Ladder of Inference’. This is not to dismiss the work of Guskey – indeed Clarke and Hollingsworth suggest there may be some pathways that are more prevalent than others and demonstrate how Guskey’s model can be represented as a possible pathway within theirs. But I think by allowing for different types of teacher change through formal and informal interactions (that may take a cyclical path of consideration and refinement) it becomes a process that can adapt and grow with a setting. It’s unlikely that any ‘off-the-shelf’ model will be perfect for every setting and Boylan et al comment on the necessity to adapt the models to fit. 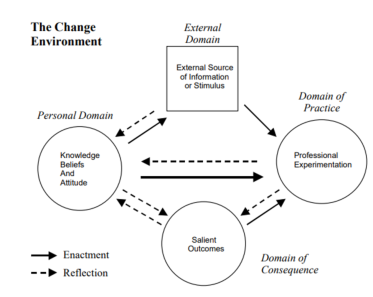 I’ve thought about how the cognitive elements of change from Evan’s model could perhaps be included in an adapted Interconnected Model of Professional Growth, and Boylan et al discuss how none of the models they compare address collaborative forms of CPD such as lesson study or professional learning communities, which may on a broader scale include social media connections. They consider that a ‘social domain’ could be added to Clarke and Hollingsworth’s model in place of the ‘external domain’ however I wonder whether external influences that are beyond a teacher’s control and those that are ‘chosen’ should be separate. It might just be that I would like to think that my own weekends full of self-led CPD aren’t simply an exercise in increasing the Dunning-Kruger effect, but my instinct is that we can’t know where people will get ideas, how they’ll interpret things or the links they’ll make, so we need to try to facilitate ‘growth’ as widely as possible. When we acknowledge that experience and expertise are relevant to depth of practice and engagement for successful CPD, I think we also need to be prepared to think about how to facilitate a range of different professional learning pathways to get there. I very much enjoyed reading your reflections on these different models of CPD and glad that some of our Sheffield Hallam team’s work on CPD models was useful to you in thinking about your own role and work.